Posted on March 27, 2019 by Kirsten Hamling. The spring housing market is off to the races! The inventory of homes for sale is increasing, buyers are out in force, and interest rates have remained low peaking the interest of buyers and sellers previously on the fence about making a move. New research regarding Real Estate Developments from realtor.com shows that the first week of April is actually the best time to list your house for sale! The report used “trends in median listing prices, views per property on realtor.com, home price drops, median days on market and number of listings on the market over the last three years,” to determine a ranking for every week of the year. It should come as no surprise that April and May dominate as the top months to sell in the spring housing market. The second quarter of the year (April, May, June) is referred to as the Spring Buyers Season, when competition is fierce to find a dream home, often leading to bidding wars. If you’re thinking of selling your home this year, the time to list is NOW! According to the National Association of Realtors, 41% of homes sold last month were on the market for less than 30 days! 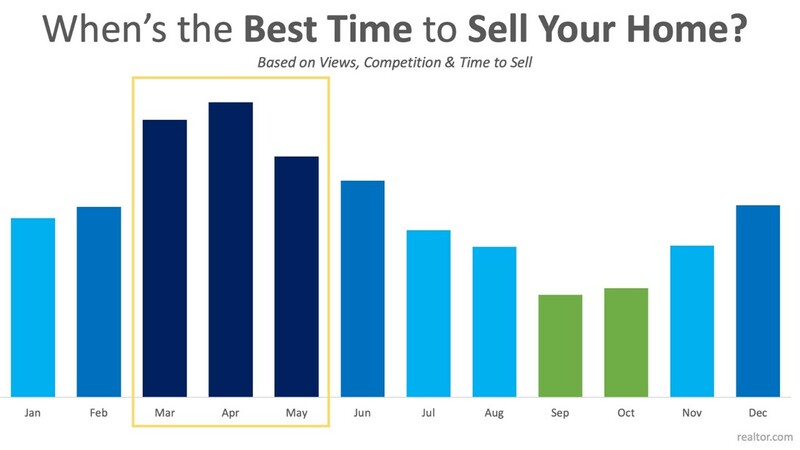 If you list now, you’ll have a really good chance to sell in April or May, setting yourself up for the most exposure in the spring housing market! To get a list of the best time to list in Denver, Aurora and Lakewood, click here If you have any questions, we’re here to help at any time. Call us at 303-779-0591.